The above info came from atomofish, and was edited by yours truly (contact me). The image came from Cinema Strikes Back. In the not to distant year of 2023, a new sport was created known as the Immortal Grand Prix (IGPX) which mixed racing, martial arts, and technology and engineering. The sport soon became famous worldwide. IGPX involved the use of giant (and extremely fast) humanoid robots called "IG Machines" and pitted two teams of three IG's against each other on a race track. The objective is simple, get to the finish line by any means necessary while fighting the opposing team along the way. IGPX takes place much later, in 2049. The sport has become a worldwide phenomenon and an entire city was built to accommodate the league. 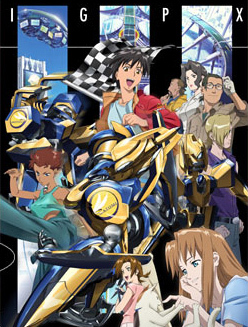 The story focuses on Team Satomi, which is lead by Takeshi Jin. Satomi recently won the IG-2 championship, advancing them into the IG-1 league. However Team Satoshi tends to be rather disorganized as a team, but an encounter with the leader of Team Velstein inspires Takeshi to get his act together. Many challenges lie ahead for Team Satomi, and opposition creates some difficult odds. Will Takeshi and his team come out on top?